We finally were able to make our yearly pilgrimage to San Diego. We usually try to make it later in the summer, but we just couldn’t wait. Plus we are coming mainly for our anniversary too. Happy 3rd anniversary to us! Three years have flown by and we have so many awesome memories together. We have been very lucky. We finally made it. Mike makes fun of me because I always have to have my hands on my hips. I never know where to put my hands. I call it the “awkward hand pose” because if I don’t put them on my hip, I look extremely awkward. 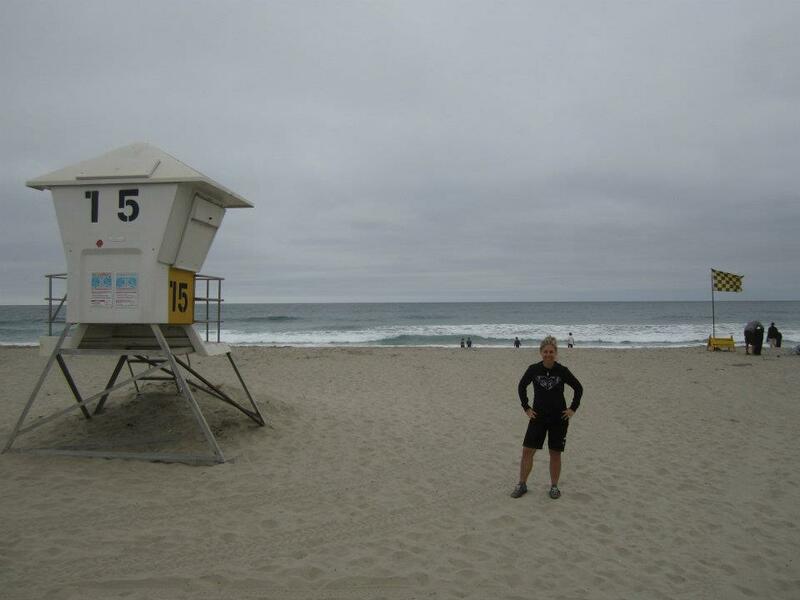 First thing we did was head to the beach and noticed it was super cloudy and cold. Boo. We never have weather like this on our trips. 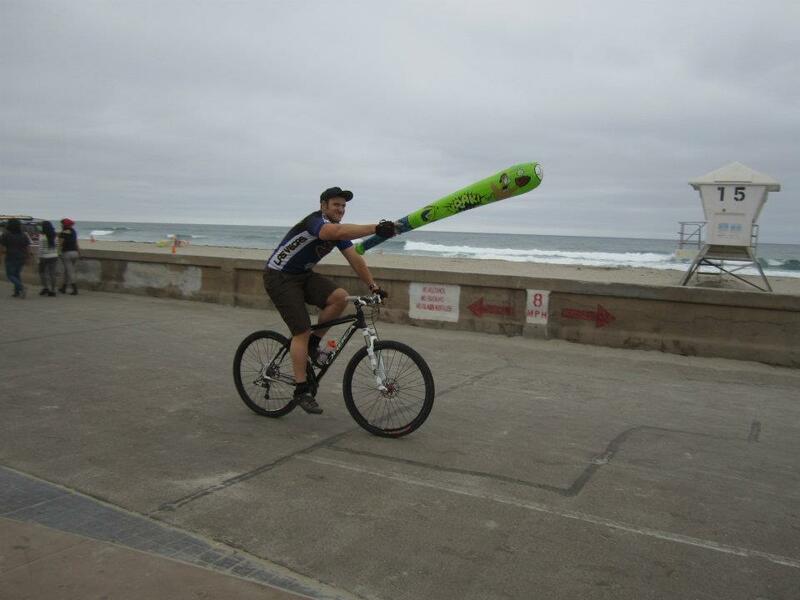 Mike didn’t let it damper his mood, so he found a blow up bat and decided to joust with it on his bike. 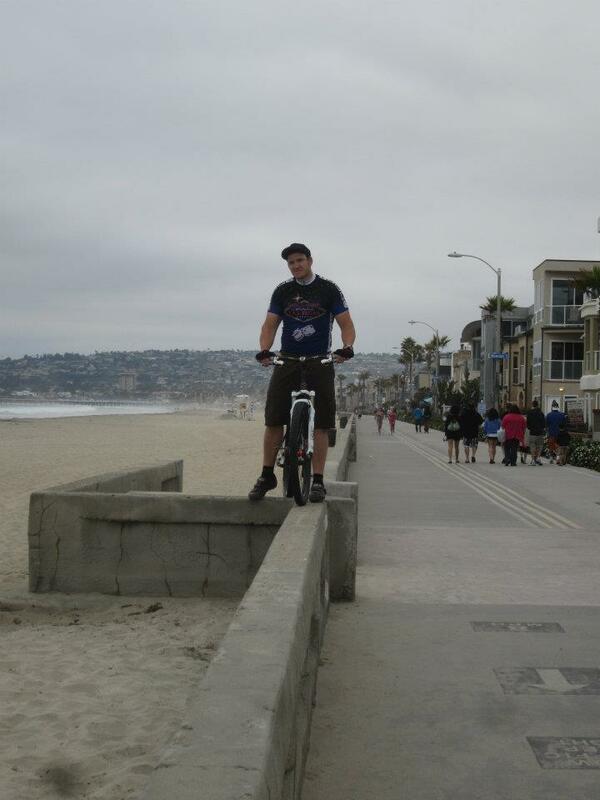 He then was trying to ride his bike along the ledge and thankfully stopped before he hurt himself. It’s nerve-wracking when people stop and say they are going to film it on You Tube for you. Dinner consisted of shrimp tacos at Wahoo’s Fish tacos (which I forgot to take pictures of) with a side of Cajun rice and black beans. I’ve never had the shrimp tacos and they were awesome! I can’t say which one I like more, the shrimp or the fish, but I highly recommend both! This entry was posted in Food, Mountain and Road Biking, Travel by thefasteryoupedal. Bookmark the permalink.